Quentin Stevick is running for Councillor in Pincher Creek Municipal District Division 1. Voting will take place on the September 14, 2015, between the hours of 10:00 am and 8:00 pm. The voting station will be located at Twin Butte Community Hall. Click here for more information. My wife, Anne and I are the owners and operators of Bar 15 Simmentals Inc. on the Township Line Road. A few years ago we sold our purebred cattle after years of successful bull sales. We supplied quality breeding stock to our customers, many of whom are currently raising livestock in this MD. We now run a custom grazing program on our ranch which I manage on a daily basis. Our entire working lives have been spent in production agriculture and everything we have is because of cattle. 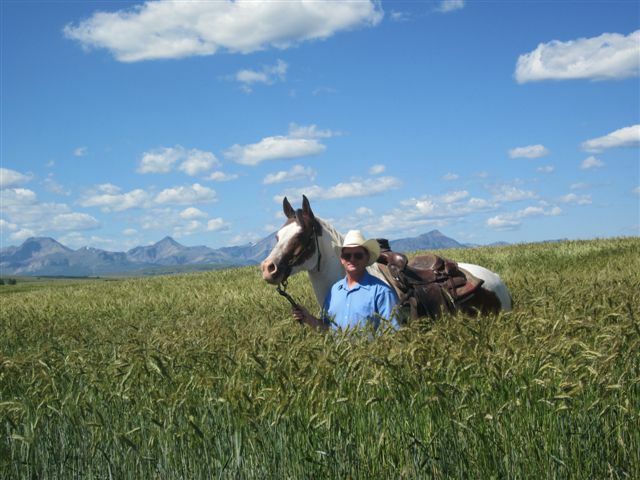 After retiring from active purebred ranching I have taken the opportunity to travel and work in various countries. Most recently I lived and worked in Russia and Kazakhstan as a livestock specialist. I was boots on the ground, doing everything that was needed from assisting calves at birth to designing and overseeing infrastructure for beef cattle. I taught artificial insemination and safety practices. Many of the people I worked with had never seen a Canadian before. They had no previous experience with beef cattle. I funded an outdoor hockey rink in the village of Golovino, Russia. There is a mural painted on the wall with a Russian flag, a Canadian flag and the Russian word for friendship between the two flags. Locally, I have worked in customer relations for the Pincher Creek Co-op in conjunction with delivering fuel. I started volunteering at an early age and have been a 4-H leader for three different clubs. I coached the 1980 Alberta provincial beef judging championship team. My associate degree in agriculture is from North Dakota State University. When BSE hit the beef industry we were financially devastated. Our bull market dried up. To get that market moving I devised a plan to have our customers donate their used bulls to local food banks. They received a charitable donation receipt and a one thousand dollar credit at our sale toward the purchase of a new bull. The bulls were slaughtered at Pincher Creek Meats and the hamburger distributed to food banks from Calgary south to all borders in southern Alberta. I continued to work with the Lethbridge Food Bank for several years and this contact lead to other volunteer opportunities with Operation Red Nose and Habitat for Humanity. Locally, I am a founding member of the Pincher Creek Watershed Group and have chaired the annual Blue Weed Blitz. Politically, I have been involved behind the scene in several provincial elections. This is the first time I have put my name on a ballot. agriculture life style and the friendly people. I still remember walking into Jackson Hardware and being greeted by two smiling, happy and helpful ladies. They still live here. When the Alberta government took our first ranch for the Old Man Dam we chose for the second time, to live and work in the MD of Pincher Creek. We just came through a community backed fight against AltaLink and their high voltage transmission lines. Many of our friends and fellow MD residents are still fighting. I have concerns with the deterioration of our rural roads. I also believe in fiscal responsibility and will be vigilant on how tax money is spent. I will work to maintain what we already have in this corner of heaven and to enhance the draw to this area by pushing forward on high quality, high speed Internet to allow people to earn a living from their homes. Many issues that face Division 1 do not stop at a line on the map. They affect many of the residents of our MD, our town, villages and by extension the rest of the province. We do not live in a vacuum. Because of my life experiences, I live the axiom "Think globally, act locally".